These instructions are specific to Kufatec/FISCON, and they provide instructions on how to install it (download it here). While the instructions are okay, I’m going to give much better information and pictures to walk you through this process so that even the most novice modders can handle this. If you picked up a different kit, fear not, most of the installation is very similar and the pictures below should help you understand where everything is and how to access the various components you’ll need to install and setup the system the first time. First, start by removing the radio using a set of radio removal keys. You insert the four keys and the radio will simply pull out – you may want to put a towel over your shifter or beneath the head unit so it doesn’t scratch anything. 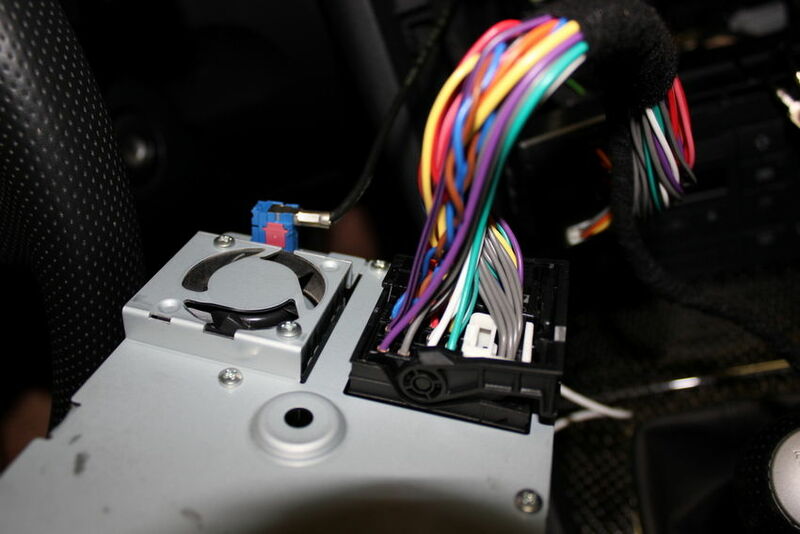 Next, remove the wiring harness from the back of the radio. 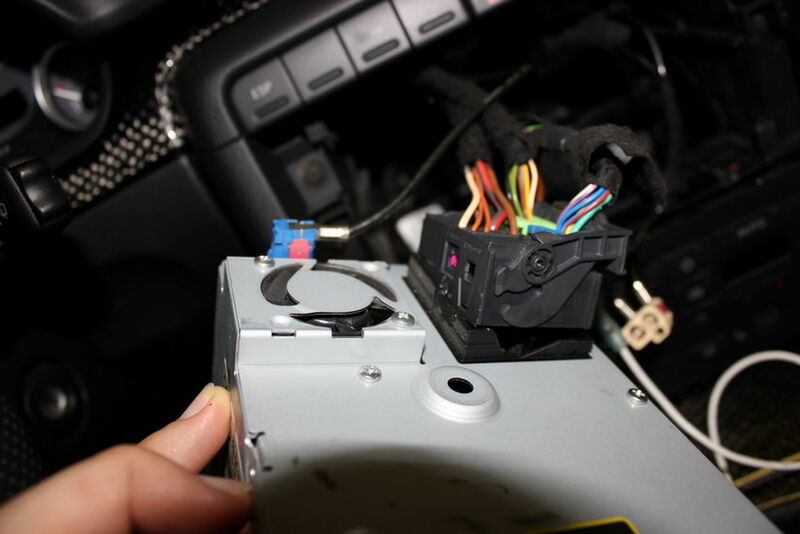 There is an arm that you have to unfasten so that the harness unlocks from the back of the radio, so be sure to unclip this before tugging at the wire – it should slip off very easily so no need to yank at it. 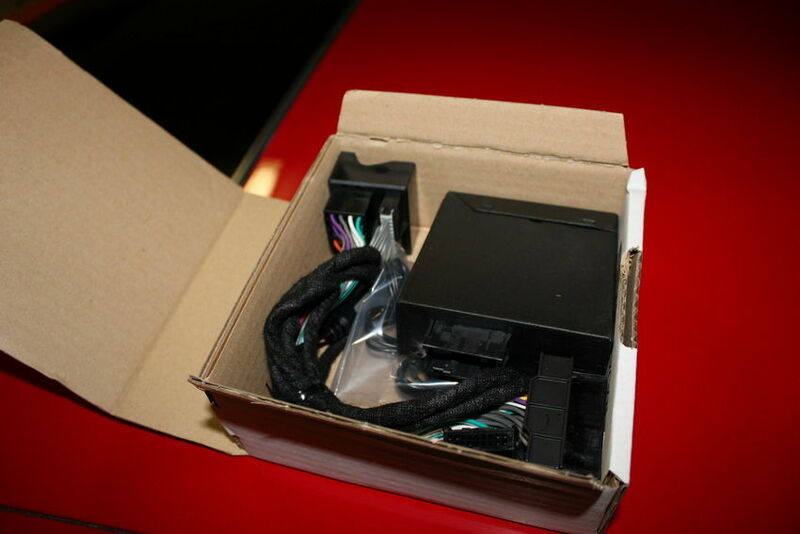 Unpackage the FISCON kit and take out the wiring adapter for the back of the radio. The plugs look nearly identical and it basically goes between the factory wiring and the back of the harness to give you the wiring you need without needing any splicing or wiring necessary from you. Like I said before, the factory wiring plugs in to the female end of the FISCON harness, and then then the male end of the FISCON harness plugs into the back of your radio. All plugs of the harness have similar locking arms, so loosen the arm, plug the harness in, then clamp the arm down to lock it in place. In the picture above, you can see the swinging arm lock – press it all the way down and it should “click” into place, holding the wiring harness securely in place. Next, you’ll want to remove the trim piece below the steering wheel so you can run the wires properly. 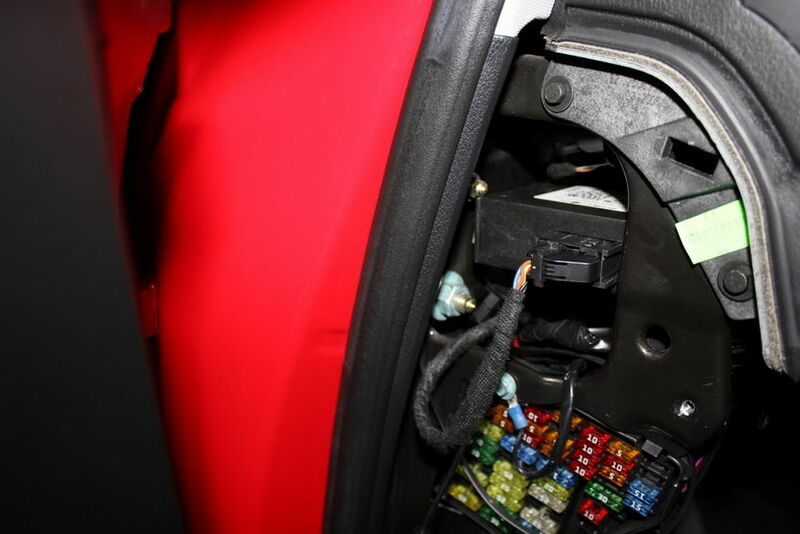 If you don’t know how to remove this panel, consult the step “Step 4 – Headlight Switch Trim Removal” in this post – it’s just three bolts and the panel drops. Now that the wiring has been ran for the bluetooth unit, and you’ve mounted the box/brain of the unit above the fuse box, you just need to run the microphone wiring. The FISCON kit comes with some clips & adhesive to mount the microphone. I started by mounting the microphone first, then tucking the extra wiring inside of the headliner and A pillar all the way down to the fuse box. There is plenty of extra wiring with this kit, which is nice if you have somewhere else in mind you want to wire the microphone for. You should be able to tuck the microphone wiring in using a flathead screwdriver, much like you would for hardwiring a radar detector. Tuck in any extra wire where the FISCON unit is above the fuse panel, and then reinstall the dash panel, fuse cover and push the radio back in. Time for some light coding! You’re done coding…now restart the RNS-E. To do this, hold down the power button for 45 seconds with the car on. Wait 45 seconds, and then hold the power button for another 45 seconds. It should cycle on/off while you’re holding down the button. Lastly, connect the bluetooth from your car to your phone. 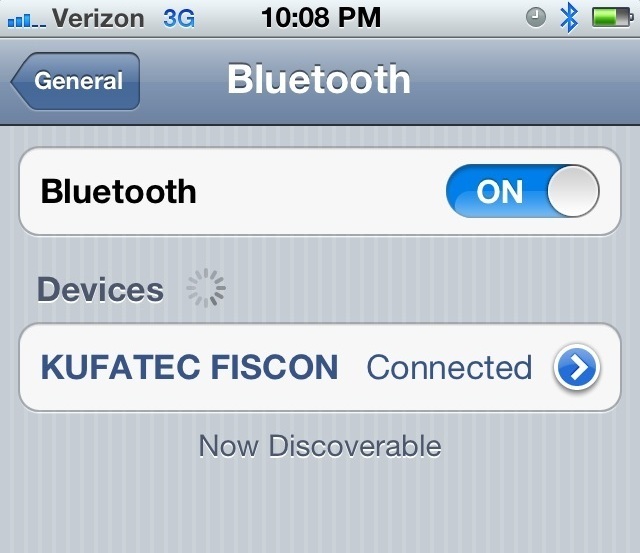 In the iPhone, go to Settings – General – Bluetooth and you’ll see “KUFATEC FISCON” as an available option (if you don’t, recheck your installation & connections). When you connect to it, enter the password “1234” and you will be connected. You should now see the phone in your RNS-E and use it just like you would the OEM bluetooth feature. Hey I have been thinking about doing this mod and nice write up! How is the sound quality? I have a 2005 b6 s4 cab with RNS-E are there different versions of the RNS-E? Should that kit you installed work for my year? Thanks!! Sound quality is great so far – both on the incoming end (person on the phone) and my voice quality to the person on the other side of the phone. And yes, it should work for any RNS-E, regardless of the year of your vehicle so you’re fine there (feel free to double check with OEMPLUS prior to ordering if you’d like though!). Thanks for check out my blog! Well, yes that was one of the main reasons for doing such mod. What other options are there to do something like that? Thanks for the info. @Jay – I guess my point is that if you already have bluetooth installed, I wouldn’t recommend this unit. Then you’ll have two bluetooth signals that are interfering with each other. I’d use the factory/OEM bluetooth that you already have installed, and then find a different way to integrate music. You can either get an Aux Out/iPhone cable you can use to connect your phone to your radio and play music that way, or you can get an iPhone cradle that goes in the center counsel arm rest that does the same thing. But I wouldn’t install a second Bluetooth module just to stream music, that would both be expensive and cause issues having two BT signals at once…. How do you operate the music streaming function? Just had my car coded today and while the phone works well, I can’t figure out how to stream music to the car from my Galaxy S3. will be answered with “The number does not exist” but the activation has been completed. NOTE: Please lock the vehicle for about 5 minutes. Please enter the code on the mobile and press dial. mobile doesn‘t support that feature you need to use a phone which does. scroll of the steering wheel (if available) you can choose the single files. NOTE: In some cases the mobile phone does not support the operation. I’m completely new to this, so forgive my ignorance. I have a 2006.5 S4 with no Bluetooth capability. I was looking at this unit, but I’m a little confused about the RNS-E versus BNS-5.0 with respect to the look. I see a monochrome display and a “color” display. Does the unit delivered give you the ability to choose one over the other? I prefer the monochrome. 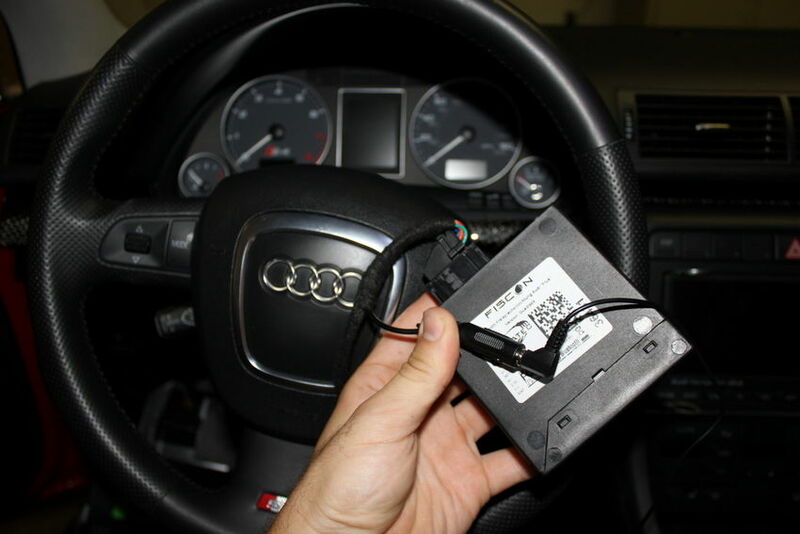 I have a 2010 Audi Q5 and have the FISCON Bluetooth “Basic Plus” hardware but can’t find anyone in Atlanta to do the install. If I can get it installed, what do you think is my best bet about finding someone with access to the VAG-COM tool to do the coding?? It is very frustrating to have purchased the product from Kufatec but not having anyone to help with the install. Any advice is much appreciated – great work on this very informative blog! Thank you very much for your feedback. I took my 2010 Audi Q5 to Autobahn Performance in Atlanta and they completed a flawless install. JR and his team at Autobahn Performance are real pros, with excellent customer service. Cool, glad I was able to help Brian! I’ll keep those guys in mind for any other readers in the ATL area. Enjoy! Hey Nick, great write up! I’m just about to grab one of these kits, but I’ve got a quick question. I have an 06 A4 with RNS-E and multi-function steering wheel. Currently when I select TEL on the unit, it displays the message “telephone not installed”. I assume this message will go away once the kit is installed, coded and paired with a phone for the first time? Just want to make sure there is nothing additional I will need. Sorry if that was a bit of a dumb question. Fred – I would double check that you don’t already have bluetooth installed. The easiest way is probably to open your phone and go to Bluetooth settings and see if “Audi UHV 5410” or something along those lines is an option – if so, that’s probably your car, and the default password is 1234. Otherwise yes your assumption would be correct, just make sure you don’t already have bluetooth before trying to install this. Thanks Nick. Double checked – no Bluetooth. I saw you mentioned the call sound is good with the unit, how’s the A2DP sound quality? Fred – it’s pretty good…not as good as being hardwired in, but good enough for me. Hey Nick – or anyone who might know – I am having a devil of a time trying to coordinate this, but might be close. I have had the new unit installed and coded, but they did not remove the old original bluetooth module, so there is apparently conflict between the two. I have been told that it is under the passenger side carpet. Is this something that I can remove with little to no tools, or do I have to take it back to have the dealer or someone else do it with proper tools? Yikes, thats a tough one. The Kufatec kit in the post above is about $600 so about the same price as you mention. I would maybe see if the dealership could beat that price, or use a site like Genuine Audi Parts to see what the dealer cost of the part is and go from there. Or look for a car that is being parted out that has that module you could buy used. But chances are you’re going to have to pay some good cash for it regardless. Is it true if you install this Bluetooth kit you will be unable to run an Auxiliary (3.5mm) input into the RNS-E? I believe I read that its either one or the other. Nice write up. But truth be told, those Fiscon Bluetooth kits are junk. People have had so many problems with them. Much better off going with the Audi OEM Bluetooth kit. I have also the Audi Navigation Plus and Fiscon Kufatec bluetooth Audi Plus. When you activate the A2DP, does it stream in stereo, or do you get this terrible telephone sound. 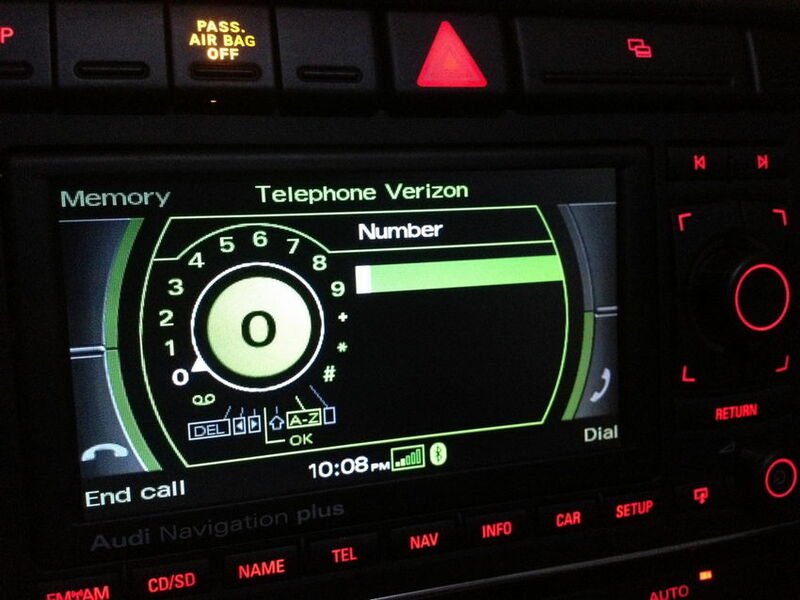 In my car it shows Phone in the FIS display. I was wondering why you wouldn’t hook the FISCON unit into the factory mic or location? That would be a cleaner look IMO. I actually had a lot of luck with an alternative solution which required much less time and money. I purchased a Tune2Air WMA 1000 that simply plugs into the factory iPod integration system, allowing for bluetooth connection from your phone. It’s not as fancy as FISCON’s solution, but their representatives told me via email that I would only have sound through the front speakers (at least with the BOSE audio). It allows for me to bypass the factory head unit altogether since I can just select music from my phone. It might be worth looking into for people who don’t have the MMI screen. The main downside is your phone is now connecting to two bluetooth sources, draining your phone a bit faster. Taylor – very cool, definitely something to check out for others. Thanks! Sorry Sergio, I’m not sure what that part is called. I’d maybe post that on Audizine or swing by your Audi dealer and someone in the parts department could tell you (and order the part for you). Nick, I am so glad I found your blog. Your post are well-researched and so much clearer that chatter on some of the audi forums. My 2006 A4 has factory nav and bluetooth, but the bluetooth carries only voice. Can you make a recommendation for streaming audio from an iPhone? My preference would be bluetooth audio, but I’d connect a cable if it’s clearly a better solution. I have a B7 s4 with the Audi nav plus. 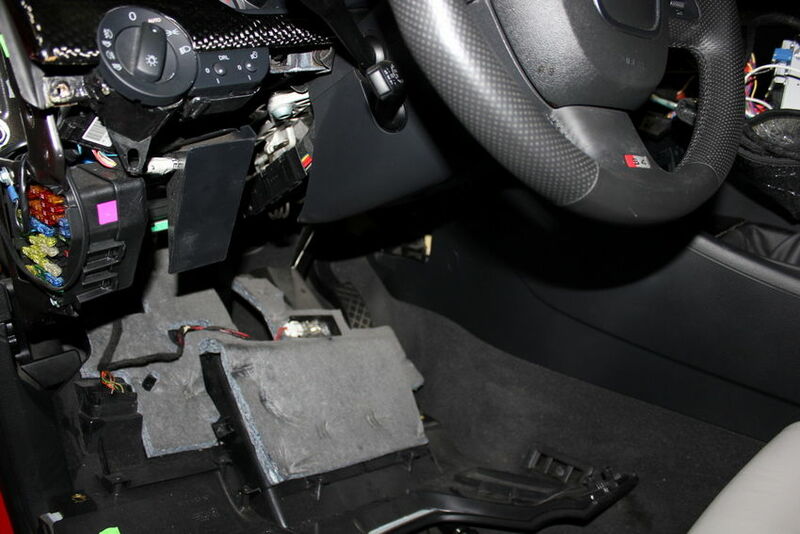 Would the a3 Fiscon unit work or which exact unit did you use for your B7 S4? Yeah, looking at Fiscon’s website now and it should be the same part. Both the A3 and A4 have the RNS-E headunit, the only difference is the faceplate for the A3 is shaped different. Will this work on 2007 A4 symphony radio with no navigation? I have an Android phone and want to stream music from phone to stereo as well as answer phone calls via Bluetooth. Any ideas? You’ll want the FISCON Handsfree Audi Basic kit instead of the Basic-Plus kit, but yes it should work well for your needs! Nick, what’s up man! Your spoken well of by a homie at AZ Euros. I was curious if this unit would work if you did not have an MMI system already? 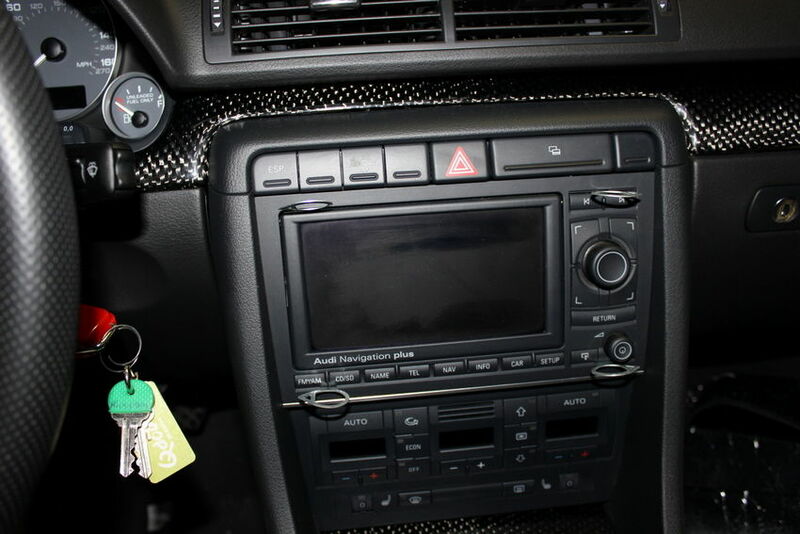 I have an A4 B7 Avant 08 and it has Bluetooth phone only integration, and the OEM Bose Audi head unit. Thank so much! Hi Nick, I should admit enjoying your well writing and clear “how to” thus and since I’m a new owner of a pre-owned S4 B7 year 2007 Cabriolet full options (means with RNS-E and Bluetooth) would ask you a couple of questions which frustrated me, I’m not able to pair any mobile phone through the Bluetooth so I’m confident that there must be something wrong most probably in the hardware BUT my search got nothing about where exactly the telephone & bluetooth module are mounted inside my cabriolet!!!!!! specially that I read that there should be an external aerial that the OEM bluetooth should be connected too as well!!!! so now I’m looking for 3 things if I’m not wrong the bluetooth (the brain as you call it), the telephone module and the external aerial in addition to that if it happened to find them what to check exactly after loose wiring and neat connection? Hi Hesham – silly question but does your smartphone detect the bluetooth signal? If you go to Settings – Bluetooth on your phone, you should see an signal for “Audi UHV 5410” or something along those lines, which is your car. 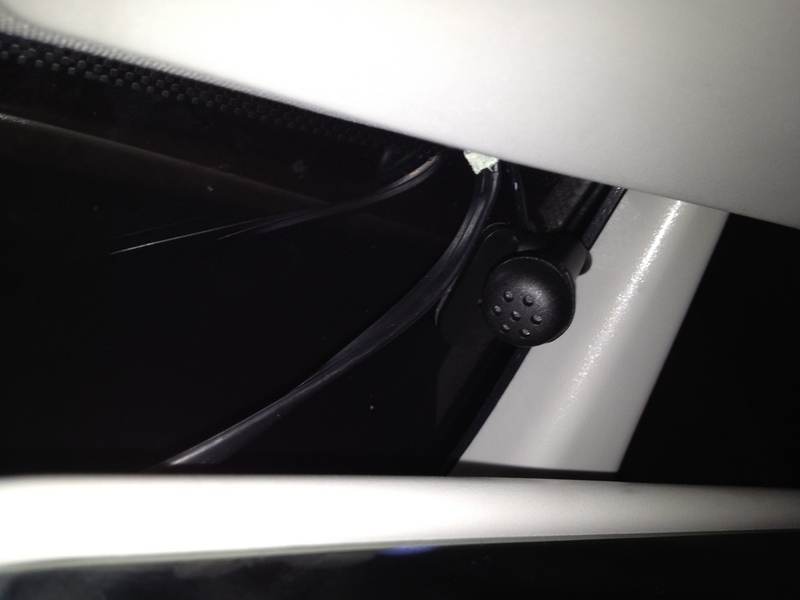 If your phone doesn’t see a bluetooth signal from the car, that means your bluetooth hardware is probably not working…if you can see it, then try to connect to it. You will need to enter a password the first time you connect, which is 1234 (your owners manual will state if that is not the case though). The external microphone shouldn’t be an issue unless you can place calls and the caller on the other side can’t hear you. The actual bluetooth module itsel is located behind the radio IIRC and difficult to reach. I have a ’07 RS4 with the Bose RNS-E that looks like your unit in your S4. The unit, as i’m guessing all RNS-E units. has Bluetooth which works only with phone calls (i.e. no streaming of media or audio oriented apps on phone). I would like to have streaming as now I have a Bluetooth Phillips cupholder speaker I use to stream and it definitely has low sound quality for anything other than talk radio podcasts. I’m guessing the retrofit here is the only option to get streaming from a Sony (Android) phone. It is a bit daunting for me due to both having to reprogram the VAG and, actually, the microphone whose cable seems more difficult to run – plus the microphone will appear as a small, but noticeable addition. I’m thinking it may be best to get a whole new head unit if there is one that will interface with the wiring and steering mounted controls. Do you have a suggestion? I live between Birmingham and Huntsville Alabama if you have any information on customizers specializing in Audi or other European vehicles. In the end I’ll probably just live with what I have, but I do find the limitations of the factory head unit (clumsy and outdated nav for instance as well as decent, yet not the full spectrum fidelity of the best current audio systems. Any suggestions? Hi Nick I have the Kufatec Fiscon in my audi A5 It is paired with Bluetooth I can hear everyone who calls me but no one can hear me. Any advise would be very grateful. Hard to say Jean – obviously the microphone isn’t picking up the sound, so it could be a hardware issue (faulty), installation issue (not plugged in, or not placed well), or it could be a configuration thing. Start with double checking installation, and also talk directly into microphone and make sure it just isn’t placed well or something obviously like that. Instead of installing the Fiscon unit, I got a Dension Gateway Five unit. My question is will changing the codes on VAG-COM be the same in the Dension unit? Will I be able to make and receive calls on my RNS-E via the tel button instead of just the steering wheel buttons? I love your blogs. Just bought RS4 grille for 2006 base model B7 sedan. The car belongs to my brother-in-law. 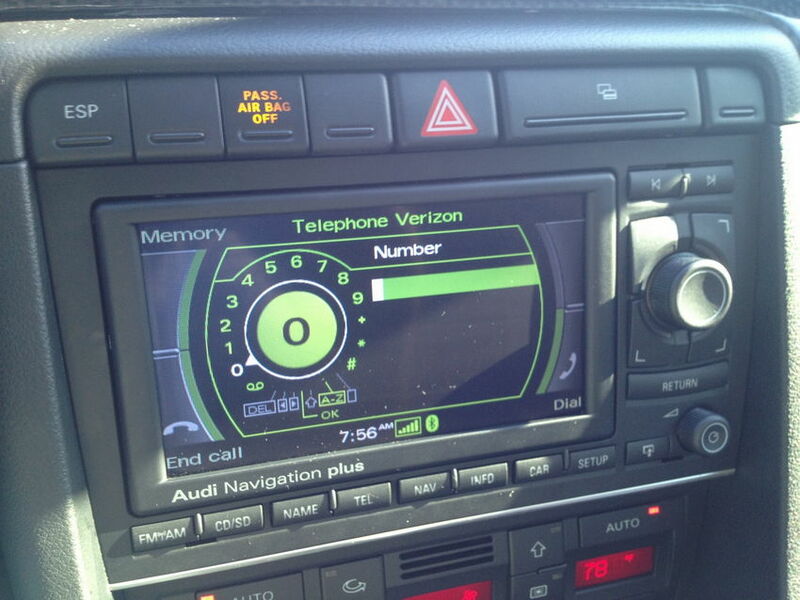 He has stock stereo, no NAV, and is looking for a way to add bluetooth to the stock stereo. Is this possible with this car? And info or Ebay links of device(s) that could achieve this would be greatly appreciated! There is definitely some options out there, but I personally haven’t tested any of them so difficult for me to recommend one or advise as to quality. As you said there are a ton of options out there. Hey Nick! After reading through the questions and responses here, I did today successfully find out that my B7 A4 has the OEM bluetooth hookup – seemingly I’m not the only one who’s only able to get it to carry phone calls. I don’t believe (I think I’ve looked in the right places – glovebox, etc) that I have a factory AUX cord. Do you have a best-option thought if I’m looking to put music through? I don’t know if a cradle or a full harness, or what, is better. Thanks! I have a couple of problems with this retrofit, having had it installed for 4 years now. ok… So I did this installed an everything. Got to the coding did changed 5th number to 6. Changed the steering wheel settings as well. I couldn’t find channel 62… don’t know if I’m not doing something right. Anyway… I was like bump it lets try it out. the unit wouldn’t reset by just holding down the big button in the center so I did a hard reboot (fm/am + set up) came back on, and my phone recognizes the bluetooth, and will let me set a pin but no option to put in pin on the audi and I get the message “your telephone might not be connected or inserted properly” as apposed to the “telephone not installed I got before”.. so I was like bump it I’ll come back to it later… some time later come back to my car and not the mmi is stuck on that screen and won’t budge no matter what I do. Any advise? also in the even i do actually get that part fixed… where exactly am I supposed to go for channel 62 to add the 02? That is strange, I would try calling the place you got the part from to see what they think…or maybe retracing your steps in the instructions? ok… so update lol.. finally figured it got. Got the bluetooth connected it works i.e., it connects to my phone but now it automatically mutes when I receive or make a call, I can’t hear the person and the person can’t hear me – but the bluetooth is connected. urggggg any ideas? Equally as strange, let me know if you figure it out. Doesn’t sound like a microphone problem since you can’t hear the other person either…sounds like it’s not transmitting either direction. I have also read of people getting the simple aftermarket Bluetooth receivers to work with the TEL functions… Do we know how the HU communicates wtih the OEM BT module? how does the HU detect the BT signal? Via signal wire? Is the Module just sending Audio signals to the Navi? Not trying to reinvent the wheel, but maybe get the basics covered and not buy a pricey complicated OEM or a Fiscon/Kufatec device. So I did an RNS-e with OEM Bluetooth retrofit. My phone connects to the Bluetooth but the RNS-E just gives me a message saying “Please use your cell phone”. Have you come across this before? Hi Nick, nice write up. 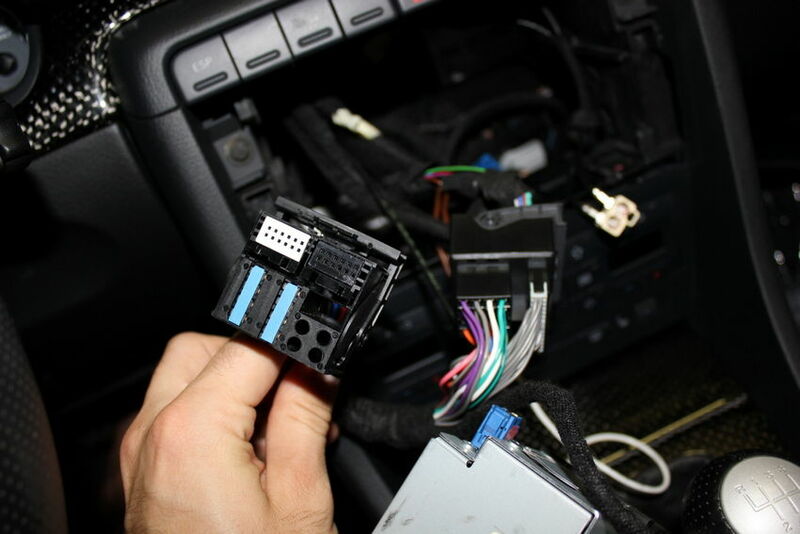 I just purchased OEM Bluetooth module with wiring for my 2004 a4 b6 with RNS-E.
Can I use same VAG-COM coding You posted? Thanks in advance. I’ve never used that specific module before, but I don’t see why the vag-com coding would be any different or unique. Give it a shot and let me know how it goes!